We have 3 beautiful yurts hidden in a private field behind the Garlic Farm. 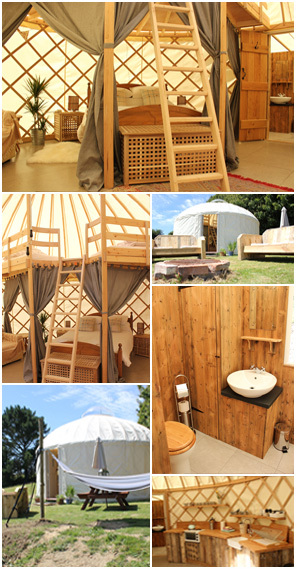 The yurts were handmade on the Isle of Wight. They are 6 metres in diametre and have a kingsize bed on the ground floor and a ladder leading to a mezzanine deck with two full size single mattresses. They have fully equipped kitchens with small oven and hobs, sink with hot and cold water and under counter fridge with small freezer compartment. There is dining space for up to 4 people and lounge area with wood burning stove. Each has an ensuite bathroom with walk in shower and flushing toilet. Outside each yurt is a BBQ, firepit and seating. At least 20 metres separates each yurt and they are insulated to keep cool in the day and warm at night. The yurts also have a winder that allows you to open and close the central perspex dome on top. There are sockets for hair dryers and charging devices. There is no wifi in the yurts but guests are welcome to connect free of charge in other areas of the farm and in the café. Each yurt is slightly different in layout and may differ from the pictures above.